Eggnog in the bread and eggnog in the glaze makes this Frosted Eggnog Bread the perfect sweet bread for the eggnog lovers in your life. It is the perfect holiday breakfast or afternoon snack. Just add a cup of coffee and you are good to go. *Be sure to sign up for the BruCrew email to receive these recipes in your inbox each day. Winter came early this year. The past 2 days have been 28*, and both days we woke up to a light dusting of snow on the ground and the roof looked like it was frosted with powdered sugar. I am so not ready for this. It has been years since we have had snow here before January. Everyone is predicting a bad winter this year. I really thought last year was bad, so I’m not sure how it can get worse. Becoming a hermit for the next 5 months is looking better and better. As long as I have a loaf of this Eggnog Bread each week, the confinement will be totally doable. The recipe for this bread came from a plastic recipe box that has been hiding up in my cupboard since we moved to this house 5 years ago. I wish I know where the recipe came from, but unfortunately I wasn’t so good at documenting that stuff. I think that’s probably how a lot of family favorite recipes happened. Someone copied a recipe, stuck it in a box, and over the years it became “grandma’s recipe” because she always made it. When we first got married, I used to collect recipes from magazines and cookbooks and write them on notecards. The funny thing is we only ever tried a handful of these recipes, but I still kept writing more recipes on the cards. Then we started having kids, and I haven’t really used those boxes of recipes in I don’t know how many years. They just sat there until this week when I saw them hiding behind the big box of cupcake liners. I pulled them out and flipped through all the cards. Some I pulled out, read the recipe, and promptly threw it away. I’m not sure what younger me was thinking about when she copied some of these down. There is no way I would ever make some of the stuff that was in there. Probably another reason why the box has been sitting forever. Then I pulled out a recipe for Orange Bread. It sounded good, so I made a loaf with a few modifications. It was good, but I added raspberries, and I think the seeds from the berries threw me off. A day or two after that, I had the absolutely brilliant idea to substitute eggnog. So I pulled out the recipe and changed a few more things on it. Holy cow! This bread is amazing! Now here is a little secret. I actually made it 2 times with a slight modification the second time. The pictures here are of the first loaf, and the recipe is from the second loaf. It was way too dark to retake the pictures of the second loaf. Just trust me on the recipe. I added more butter to the batter, and instead of melting it, I added it into the mixture soft. The 2 loaves looked pretty similar. But there are some differences. I think the extra butter made it softer and fluffier, but dense at the same time. I had good intentions of saving the second loaf for pictures, but then I cut it open and took a bite. Yeah, that loaf never had a chance! 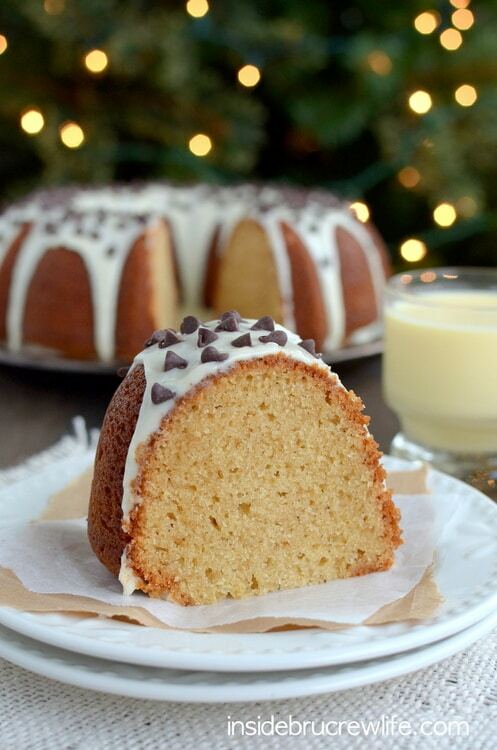 Trust me…if you love eggnog, you will go gaga over this Frosted Eggnog Bread. Eggnog in the bread and in the glaze makes this the perfect sweet bread for any eggnog lovers in your life. Grab a cup of coffee and a slice to start each morning with. Beat the butter and sugars until combined. Add the extract and egg and beat again until creamy. Stir together the flour, baking powder, baking soda, salt, and nutmeg. Slowly add the flour mixture alternately with the eggnog into the butter mixture until everything has been combined. Pour into a greased 8 1/2 by 4 1/2 bread pan. Bake at 350 degrees for 58-60 minutes. Remove from the oven and let cool in the pan for 15 minutes before removing to a wire rack to cool completely. 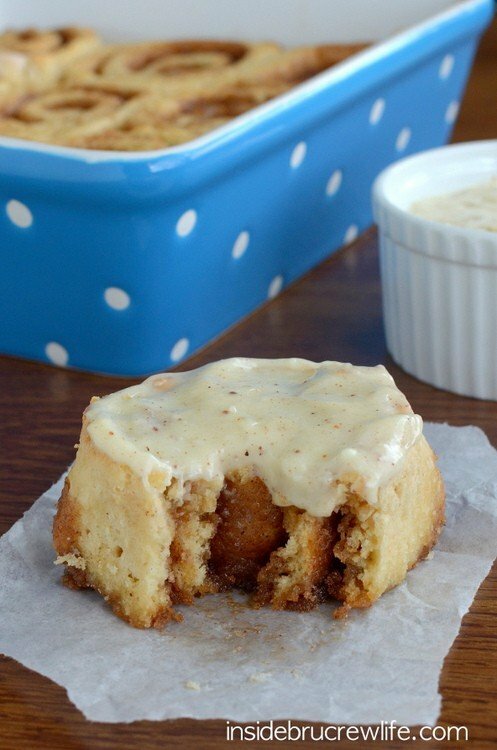 Stir together the powdered sugar and remaining eggnog until a thick frosting comes together. Spread it over the top of the cooled bread. Sprinkle with nutmeg. Let set. Store in a loosely sealed container on the counter. The post Frosted Eggnog Bread appeared first on Inside BruCrew Life.